Spalding United Blue Under 13s celebrate their League Cup success. 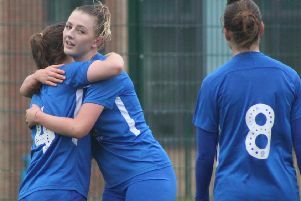 The first two Peterborough Junior Alliance League cup finals were held at Chestnut Avenue yesterday (April 7) and produced two emphatic winners. The Under 13 League Cup final was betwween Division One rivals Spalding United Blue and March Academy Blue and the former came out on top by a convicning 6-1 margin. 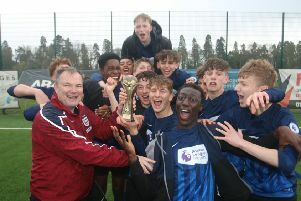 League Cup runners-up March Academy Blue. Man-of-the-match Ben Greenacre (2), Tyriece Buffong, Connor Beeken and Derrie Maxwell found the back of the net for Spalding with an own goal completing their tally. Harry Edwards scored for March Academy. And there were even more goals in the Under 13 Hereward Cup decider. That was between Division Three table-toppers JFC Boston and Hungate Rovers and it was Boston who won this one 7-2. Their goalscorers were Murilo Max Camacho Santos (2), Daylen Scholefield, Matas Gecas, Riley Stevens, Javier Quevedo and Harvey Warsap while Jay McMullen netted both Hungate goals. Man-of-the-match was Hungate’s Jacob Summers.